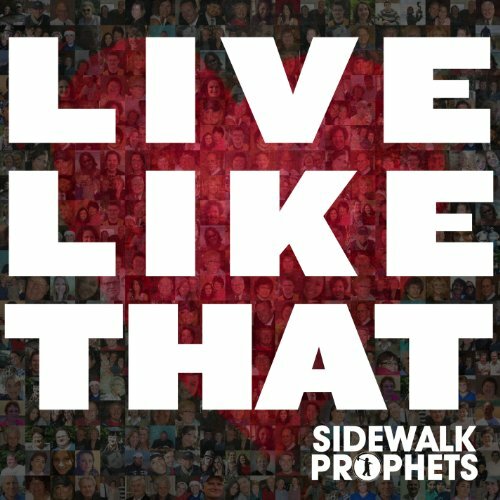 Sidewalk Prophets present their sophomore album, Live Like That. The first single is the title track off the album and plays a strong part in the overall messaging from the band. With the help of their fans, Sidewalk Prophets album cover encompasses the faces and hearts of people all across the country who have inspired someone to "live like that. " "There comes a point in our lives when we ask: what exactly is this life for? It s in those moments that I m reminded of those who have impacted my life my grandparents, parents, teachers and pastor and whether they knew it or not, I saw Christ in them, " said Dave from Sidewalk Prophets. "This album is a reflection of our journey in music and our desire to live our lives in such a way that it is rooted in a deep passion and love that knows no bounds. " Following in the footsteps of their debut album, Live Like That (produced by Dove Award winning producer Ian Eskelin), is a powerful musical devotion that weaves together thought provoking lyrics and melodies. Each song on the record was written/co-written by Sidewalk Prophets Dave Frey and Ben McDonald. Sidewalk Prophets fans were able to participate in the creative process of the album, singing background vocals on "Love Love Love" and "Nothing s Gonna Stop Us. "